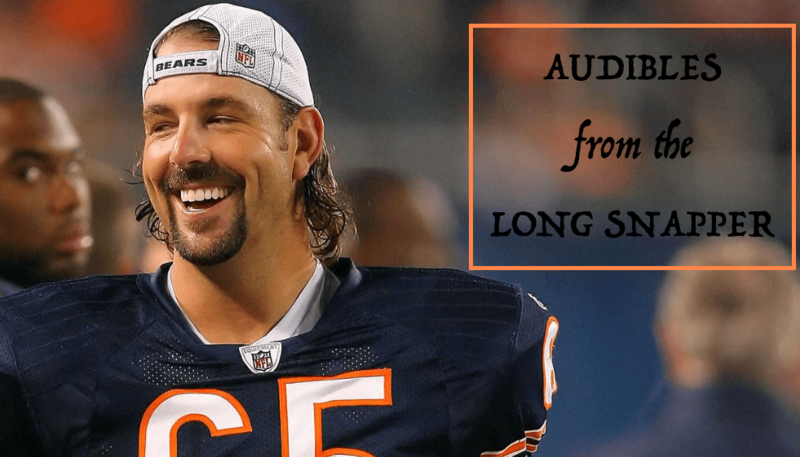 Da Bears Blog | Audibles From the Long Snapper: Positive Jahns, Around the League Thoughts & More! Audibles From the Long Snapper: Positive Jahns, Around the League Thoughts & More! 4. The Bears missed linebacker Nick Kwiatkoski (four tackles on Bucs’ first drive). Christian Jones missed Jacquizz Rodgers in the backfield on his one-yard touchdown run. Kwik looked terrific when this game began. He was firing at the line of scrimmage. And then, injury. Because it’s totally normal for a starter and his backup to both tear their pec muscles in consecutive weeks. Remarkable how many rosters are already being decimated just two weeks into the season. 8. Want a positive? Bears rookie safety Eddie Jackson was strong in run support. He’s made a concerted effort to improve his tackling. 9. One more positive? Bears nickel back Bryce Callahan rebounded from his tough Week 1 and nearly had two interceptions. He was active and very close to big plays. Jackson, Callahan and Kyle Fuller are all playing at a solid level and I expect all three to improve as the season progresses. Literally found my eyes wandering from the Bears game during the second half Sunday. So I saw quite a bit of the league. (1) Dak Prescott is really a poor thrower of the football. I think he has enough intangibles to have a successful career in the league but that arm is never beating anyone from the pocket. (2) Seattle and the Giants should be on the phone with Houston non-stop in an attempt to acquire left tackle Duane Brown. Brown is holding out, has told Texans he won’t report til after Week 7 and those clubs are simply desperate for OL help. (3) How can the Saints just never get defense right? You’d think, by chance, they would stumble upon a few decent players. But that is one of the worst groups in the sport year-in-and-year out. After the first quarter yesterday, I thought Tom Brady was going to throw for 700 yards. (4) Cam Newton should be a warning to Mitch Trubisky. It doesn’t matter how big and strong you are in the NFL. The human body can only take so many hits. Newton looks like a shell of himself. (5) I am not sure the Packers are any good. Still can’t believe John Fox punted on 4th & 2 at his own 47 w/ 1:12 left in 1st half. Down 23-0, they had to score before halftime. Mike Silver with a cool profile of the offensive makeover Mike McCoy has orchestrated in Denver. Several people have told me McCoy got a bum rap in San Diego and will be a successful head coach in his second stint. One wonders if he may not be interviewing at Halas Hall come January. Brad Biggs thinks the Bears will be having “high-level talks” this week about making a change at the QB position. When they make that change – and it should have been made a month ago – they should seriously consider releasing Mike Glennon. What purpose does he serve as a backup? Greg Gabriel was not thrilled with Bill Barnwell’s piece on Colin Kaepernick. Barnwell’s defense was solid: “in a league where Mike Glennon’s getting $15 million/year, don’t see how Kaep isn’t worth a roster spot.” He’s not wrong. Paul Domowitch, one of my favorite beats in the country, talks about Carson Wentz inching closer to greatness. Good piece to help fans understand the journey of a young quarterback in the NFL. Did Jay Cutler throw the worst Hail Mary in the history of the NFL? CLICK HERE and judge for yourself.